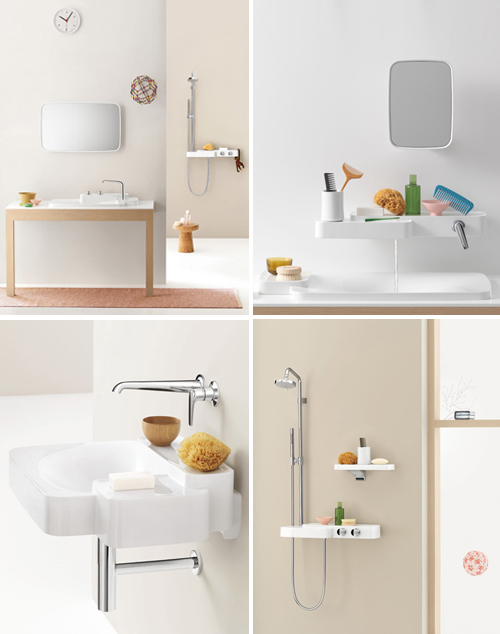 French designers Ronan & Erwan Bouroullec have designed a bathroom collection for German brand Axor. The result is a comprehensive collection of 85 items including different sorts of basins, mixers and solutions for the bathtub and the shower areas that can be arranged freely according to one’s needs. I love this collection. It’s clean, fresh, and simple- perfect for the bathroom. Love the shape of the mirror! A little too sterile looking for me but it is beautiful. I have to admit that the sink and mirror unit is fascinating. I love the clean modern look of this bathroom. A bright clean spacious look without any clutter. I like the mood in the pictures. Great Collection!!! i love their stuff!!! I like the minimalist approach in this bathroom design. It gives a feeling of a bigger, pristine space. Elegant, very neat. I’d love to have my bathroom design the same way..hopefully soon.